Henry won for 8th and 6th grade and Ybarra won for 7th for the first time in history. The clouds over DCIS cleared for the 10th annual color rally on Friday, Mar 22. Student’s energy raised the roof of the gym, which was beautifully decorated with balloons and signs. Each of the five PE teachers chose a theme relating to their color. There was Mr. Henry’s Army, Mr. Nemecek became the Dark Knight, Mrs. Rose led her firefighters, Mr. O had his group of baby sharks and Mrs. Ybarra pillaged with her Vikings. Students participated in Hunger Games, a 2-person obstacle course, a 2-person scooter race, a 4-person scooter race, and tug-a-war. “It felt great [to be part of the color rally]. A lot of energy,” said Preston A., a 7th grader here at DCIS. PE teachers and Leadership worked throughout the month to prepare the props for each teacher. Mr. O needed cardboard sharks and confetti cannons made, Mr. Henry needed 2 tanks and 2 confetti cannons, Mr. Nemecek needed a fake jail made, Mrs. Rose needed a fire truck and Mrs. Ybarra needed a Viking ship. In each grade level, each teacher made astounding entrances, thanks to the help of students. Soon after, on the confetti-flooded floors, Hunger Games took place. In 8th grade, Mr. O won, without either participant being eliminated. In 7th grade, Mrs. Ybarra won, scoring 3 points, thanks to Christian Romero. Nemecek came back and won in 6th grade. The next event was the Obstacle Course. During which one student had to ride around the gym, then join the other student and together they had to walk with wooden planks. Then the second student had to crawl through debri, and then jump through a hoop. In 6th grade, Mr. O’s class won for the boys and Mr. Nemecek won for the girls. In 8th grade, the girls in Nemecek won. And lastly, Henry won in seventh grade. After that was the 2 person bobsled. On personalized sleds for their teacher, they raced along the track to cross the finish line. One person sat on the sled, while the other pulled the vehicle. Mr. O’s class won the 7th-grade boys competition. Mr. Nemecek won 7th-grade girls. Rose won 8th-grade girls. In 6th grade girls, Henry won. In 8th grade boys, Henry won. In addition to the 2-person bobsled, there was a 4-person bobsled race. The same event as the 2-person, however one extra person on the sled, and one person pushing on the back. Mr. O’s class won the 7th-grade boys race, and Mrs.Ybarra won the girls race. Mrs. Rose’s class won 8th-grade boys, and. Mr. Henry won 8th-grade girls. Each then participated in tug-a-war. After gaining all the points they could, Mr. Henry’s class won both 8th and 6th grade, while Mrs. Ybarra’s 7th grade class won for the first time in school history. 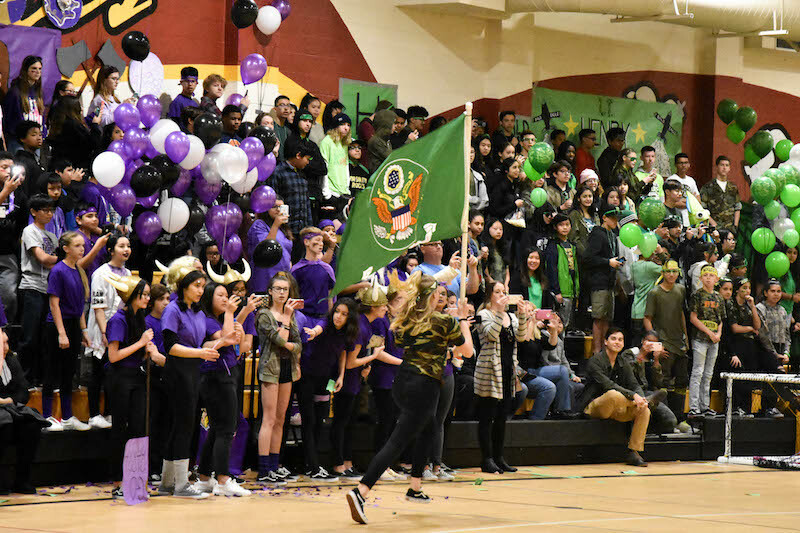 As the school year comes to an end, we are all left wondering, who will win next year’s color rally?